“I’m buying a pair for my husband,” she says, putting the pair of black boots down on one of the benches where folks generally plop their butts while trying on the footwear that has become among the favorite “I’ve been to Nashville” souvenir. Morning to nighttime daily, tourists swarm the seemingly endless number of boot shops on Lower Broad and the honky-tonkin’ feeder streets, looking for the ideal footwear and the best bargain. The buy-one, get-two-free signs taped on the doorways and windows of many of these businesses draw in folks like Vanessa Sielert, the saxophone prof visiting Nashville to represent the University of Idaho in a meeting of university music department chairs from throughout the country. “I’m currently the interim chair,” she adds, pointing just above her left breast to where the “Pride Gold” school-color logo of the Vandals athletic teams rides proudly. “I’m not a country music fan,” she pronounces as something resembling Warren Zevon’s “Werewolves of London” blasts from a too-near “country” bar. Depending on beer intake, audience members likely need to choose between “Yee-Haw” and “Aaaooo” at the song’s conclusion. Despite the “country music” mix of weeping steel, Eagles covers and Buffett songs bouncing between the brick buildings of Lower Broad, the professor professes Nashville is a good place to have a meeting. She shares this observation with folks from throughout the world who cram the sidewalks, stepping around the opportunists in the Trump and Kim costumes – you can get your picture taken with these two unlikely good ol’ boys for a price – to succumb to the overwhelming array of boot-selling signage and at least try on a pair. “The reason we do (buy-one, get-two-free) is it intrigues (passersby and potential customers) and gives them a reason to come in the door,” says Mark Waller, assistant manager at Boot Country. 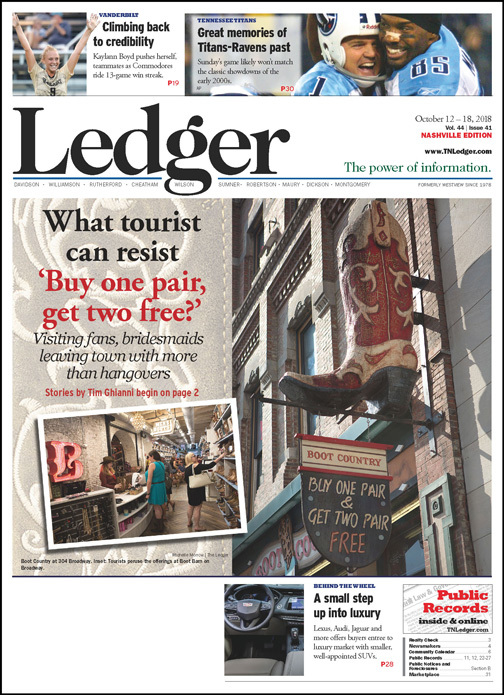 Boot vendors could simply discount single boots, but “this gets more foot traffic,” Waller says. The sax prof/university exec explains her husband, Vern, director of jazz studies at the school, is a good guy stuck back home who deserves the perfect Nashville souvenir. Whether she settles on black, brown, red or whatever color, she wants to take him a dandy pair. “They are something unique from Nashville,” says the 44-year-old before admitting the buy-one, get-two-free bargain blasted on the Boot Country storefront is irresistible, even for a trombone professor from Idaho who doesn’t like country music. She decides on a “nice, new pair of black ones” for her husband while she continues her personal pursuit. “I like them because they have the high heel,” she says, standing up straight to reveal the pair she’s trying on adds perhaps two inches to her petite body. She admits that the 2-inch ego boost is one reason for wearing cowboy boots. She continues her search, winding through the storefront crowd that backs up days’ worth of store managers’ brags that the sales of cowboy boots to tourists is exploding from the narrow shops and out onto the streets of Music City. “I’ve met everyone from Kansas to China,” says Dakota Neuman, manager of Nashville Cowboy, 132 Second Avenue North, just a few bootsteps from the action on Lower Broadway. He notes that his boots range from $199-$600, but the popular buy-one, get-two-free offering – available at many of the stores – takes the price down for the individual boot, of course. “When you do that, the average price then is $69.99-$99.99,” he says. That sale price is particularly popular with the bachelorette parties and the burgeoning complementary growth of bachelor parties spreading cash, whiskey breath and wild seeds in the streets and hotel rooms of Music City. “Business is great,” adds Marty Faehr, assistant manager of Boot Country, 304 Broadway, when asked about the bachelorette boot-buying boogie that, by nature (or hormonal scent) now has led lusty bachelors here as well. “Everybody is coming into Nashville, as you can see how busy we are these days,” he adds. 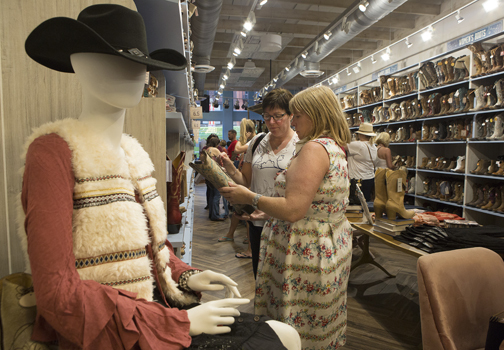 Lynn Wingate, right, and friend Jane Baker of Scotland enjoy a birthday trip together in Downtown Nashville as they shop for boots in Boot Barn. The bachelorettes in their matching, form-fitting T-shirts and the bachelors likely in khakis trousers or shorts and Johnny Cash or Blake Shelton T-shirts “all are having fun and are in a great mood.” That “great mood” increases as the day grows longer and empty kegs pile up in backrooms and alleys. The average bachelorette party size is a half-dozen, and it only takes the purchase of two pair to make sure all are teetering on boots when they leave the door. The young women who have made the city the trendy destination for one last kiss (or whatever happens) for the bride “are having a good time. It’s: ‘You come here to party and have a good time,’” he says, adding that there are sober customers as well. “And we stay open late, too,” a last-destination souvenir stop when the party’s over. Trail West, 126 Second Avenue South, manager Jeff Perry also notes these orgasmic group excursions are good for sales. Nashville Boot Company, 603 Eight Avenue South, manager Randy Ford generally appreciates the cash outlay of the bachelorettes (and now bachelors) when relishing this trendy pre-marital shopping. It’s a bit off the boot-buying path, but Lucchese, 503 12th Avenue South, in the high-end hipsters’ Gulch, turns Nashville’s tourist trend into a major and expensive “experience,” according to general manager Dustin Bowen. That can be quite an investment, since a stock pair of boots there goes for $300-$12,000, and custom boots, built to order for the foot of a specific person, start at $600 and run into the many thousands. “Our boots are 100 percent handmade, leather all the way,” he says, adding that for those who want custom boots, “we outline their feet in foot-mapping books. Take seven to 10 different measurements of your foot.” That information is filed away for use by the El Paso-based factory’s boot-makers. “That way if you are ready for another pair, we can put that order in for you” without the customer coming back to the store. He lists Arnold Schwarzenegger as just one of his celebrity clients. “I sold him his 50th pair. He was in town for an awards show. … He is a huge advocate for Lucchese boots. We give him the same treatment as anyone else who is interested in getting fitted and buying our boots.” He terminates each deal with a wad of cash. His is not the typical boot store, for sure, and he knows it, pointing out that the store hosts events, goes out on visits to do custom fittings and more. Corporate employees looking to surprise their bosses, artists getting their first No. 1, these are the types of people who come to the design loft. “We bring them in, give them that true Southern hospitality. “Cheap boots ain’t good and good boots ain’t cheap,” he says. With his stock, “you’re going to remember your trip to Nashville.” Especially when the credit card bill arrives. Trail West’s Perry says whatever boot a person buys, most do it to remember their good times in the city of stars, bars and (less frequently nowadays) steel guitars and these are souvenirs they can incorporate into their lives back in Des Moines or Yonkers. “I think country music in general has gotten to be more popular than it was,” he points out, noting that the musicians and their footwear help boot stores. “Country music has turned more to the pop side,” he continues. “Country music is kinda cool” to younger people with disposable incomes and boots on the brain. The type of leather and customer desires set the price. Faehr, at Boot Country, says his prices range from $50-$90 for kids’ boots, $150-$499 for ladies’ boots and $200-$599 for men’s boots. Reached at her desk back at the Lionel Hampton School of Music in Moscow, Idaho, Sielbert says she is more than happy with her Nashville shopping experience. While before her trip to Nashville she had other types of boots – it snows like hell up in potato country – she had no cowboy boots. In addition to the black ones she bought Vern, the jazz professor, she ended up buying two black pair and a white pair for herself – the buy-one, get-two-free deal also included a bonus incentive if customers bought a fourth pair, she explains.